The idea behind the 'BabyBass' was initially that of a quality small speaker for a very small room, driven by a low power amplifier rated at 2x30Watt RMS at IHF conditions (ie at 20-20000Hz with no more distortion than 0.08%). 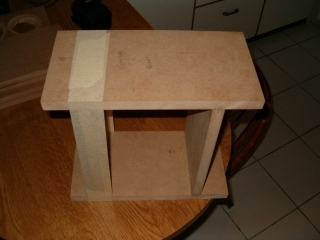 In the process some people asked for a version that could be used as a 'bookshelf' speaker or a desktop-computer companion speaker. 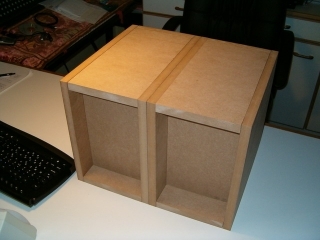 All three cases could only be addressed by a small enclosure with less than 30cm (12'') height. Vertical gap between adjacent bookshelves is usually set equal to A4 paper sheet height (30cm). General specifications mentioned above can only be met by a very small cabinet volume less than 12 liters. 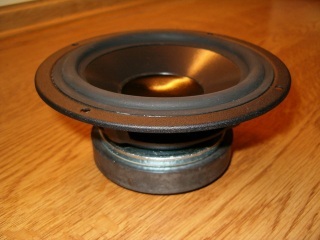 6.5'' woofers would be an excellent choice but they can rarely fit such a small volume. So we have to use a 5.0-5.5'' woofer instead. In fact we must make sure that the (vertical) sum of our woofer and tweeter flange diameters (along with additional 1cm clearances) do not exceed the 30cm limit. Power handling will not be an issue so we can choose a low-power woofer. However all people involved in this project's specifications asked for high quality sound reproduction without using an excessively high cost set of drivers. We finally selected the Peerless 850108 5'' woofer and Vifa D25AG-35-06 chambered tweeter to be mounted on a 15mm wall thickness. We also thought that overall speaker-impedance correction would not be necessary. However DIYers involved in this projects declined our last two suggestions and asked for a bigger wall thickness (19mm) and an impedance correction scheme. 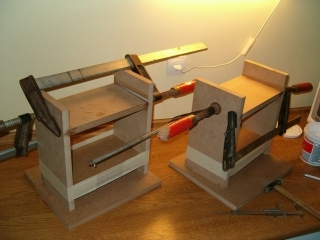 This 'audiophile' approach is very popular among DIYers. However the enhancement in reproduction quality that is expected to be gained by such measures should always be carefully analyzed and weighted against cost increase. Reproduction clarity gained by wall thickness increase can rarely be detected in low SPL levels. On the other hand this project is definitely not planned to reproduce high SPL levels so.. 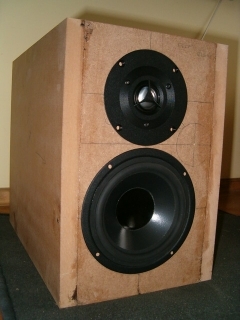 Cabinet design can not be accomplished without a series of steps based on woofer datasheet. The drivers' specification sheets are shown below. Both of them are freely distributed for DIYers and can be found in this site's respective section and elsewhere over the internet. We followed the steps described in the tutorial article "The Design Protocol : Part 2b, VB tuning". Using the formulas presented for flat SPL response we came up with a suggested net box volume Vb=7.8 lt. We decided to provide our woofer with a bigger enclosure volume around 10.0 lt so that a lower cutoff frequency is achieved. To ensure minimum port turbulence noise we calculated the minimum vent diameter as Dvmin=48mm approx. We decided to use the usual 2'' tube (50mm total diameter - 46mm internal diameter). Next option of tube size having an internal diameter of 71mm would change all our baffle and cabinet design. Since the drivers-plus-vent diameters sum up to 299mm (without any clearance between them) and our baffle height is not supposed to exceed 300mm, we decided to use a geometry scheme that saves space (and height) and is shown on the right. In this way not only a small clearance between drivers and port was preserved but overall height target and elegance were maintained. Internal height and width were set equal to 260mm and 165mm respectively. We did not choose to use a narrower baffle width for it would lower baffle area and increase diffraction strength. Woofer and tweeter placement is a bit asymmetrical in a horizontal sense a fact that further decreases diffraction strength. With an internal baffle crosssection area at 260mmx165mm = 429cm2 we deduced that a net box volume of approx. 10.0lt would be formed only if internal depth reached the value of 23.3cm approximately. We chose a 23cm value producing a net volume of 9.87lt. Woofer chassis depth is 63.5mm so it penetrates box volume by only 63.5-19=45mm approx. and leaves out a very large clearance of 230-45=185mm! The same formulas suggest a resonance frequency at 50.7Hz and a port length at 16cm approx. The rear chamber was intended for housing the crossover circuit pcb and isolating it from driver vibration. 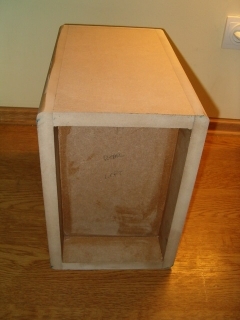 Pictures that follow illustrate one of the possible ways this enclosure can be constructed in a DIY sense. 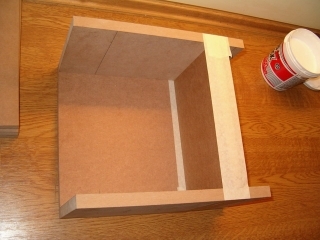 Baffle board are marked as per drawing for the necessary driver and vent cut-outs. 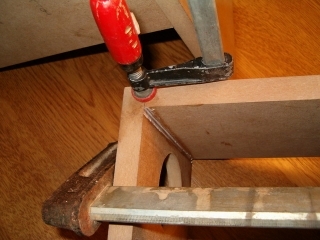 Holes and flange cut-out usually require professional tooling. Each cabinet consists of a baffle board, two side pieces, a top piece, a bottom piece, an inner rear piece and an outer rear piece (the latter not shown). An outer rear board and top and bottom pieces are fixed together with adhesive tape. Outer rear board is placed far away from the pencil line where the inner rear piece will be glued. Left-side piece is used temporarily for fixing purposes. Side piece is removed now. Inner rear board is glued in its final position. 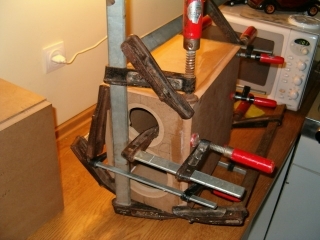 Pressure is exerted on top and bottom pieces so that inner rear board is glued effectively. Baffle board is glued in position. Outer rear board is placed in its position temporarily for fixing purposes. We make sure that top,bottom pieces and baffle board align perfectly. Side pieces are also glued in their final position. Permanent pressure guaranties a rigid and air-tight enclosure within a few hours. 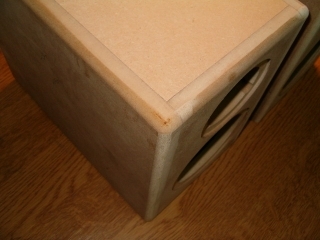 The result is a quite elegant speaker cabinet. Smoothing out the enclosure's edges may take an hour or so with a vibrating sand-tool but it is mandatory. A few holes at the inner board will let driver cables be connected to crossover pcb. 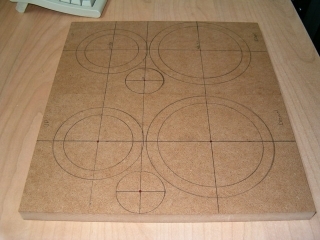 Outer rear board -not shown here- may also need a rectangular cut-out for the binding post plate. Depending on the success of the crossover network this speaker may sound astonishingly well..
All photos shown above appear courtesy of MTZ audio. We all know that small speakers lack a good SPL balance between bass and mid- frequencies. Most designs deliver a 89-90dB SPL level above 800-900Hz and a poor bass of 80-82 dB around 80-120Hz. It is this imbalance that creates audio enthusiasts' dislike for very small speakers. We therefore decided to use the low-pass filter of the crossover network for suppressing mid-frequency SPL by a few dBs so that this imbalance is less detectable. 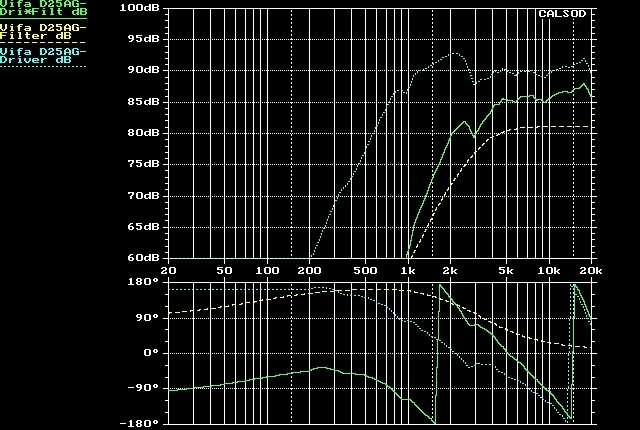 The above graph shows the SPL response of the VIFA, 1'' metal dome tweeter D25AG-35-06, mounted on BabyBass enclosure and measured at a distance of 1m on an axis we called 'mid-axis'. 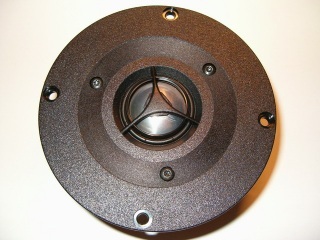 This was defined to be parallel to woofer and tweeter axes and lie somewhere between them so that it associates with the actual position of a listener's ears whenever Babybass were to be mounted on stands suitable for small speakers. In BabyBass woofer and tweeter drivers are very close so that changes in SPL graphs of these drivers become bery small when we move microphone axis from woofer axis to tweeter axis. This graph is actually a double one since it consists of two curves one for each piece of tweeter measured in the lab: light blue and red. Detectable SPL difference occurs at very low frequency and well above 20kHz. The former could be a measurement artifact (we have said a lot about it in the respective tutorial article), and the latter is very common for strong metal dome resonances. However both of them lie outside the operational frequency range of our tweeter. Generally speaking the SPL match of these (randomly selected and bought) two pieces of VIFA tweeter is excellent. In the same graph one can easily observe baffle diffraction anomalies that 'perturbate' the 800-3000Hz range, not originally present in the manufacturers datasheet. 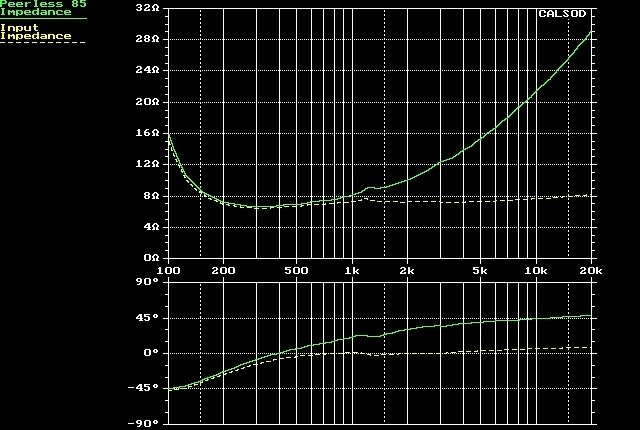 Figure above shows the respective SPL curves for the two pieces of PEERLESS 850108 5.5'' woofer measured at 'mid-axis' and at a distance of 1m again. Match is also excellent; a fact that reveals a well coordinated manufacturing process. Measurement accuracy goes down to 300-400 Hz due to the finite nature of the Impulse Response (IR) segment acquired in the lab room. As explained in the respective tutorial article the lowest trusted frequency of SPL measurements is inversely proportional to IR 'anechoic' segment duration. The latter is compromised by wall reflections that are unavoidable in closed spaces. Whatever the cause for not having accurate SPL values below 300Hz, no design of the crossover network can be initiated unless the problem is resolved. We therefore took near-field measurement covering the range 20-400Hz, and 'spliced' it to the previous measurement with a suitable process. NF (near-field) measurement was acquired with BabyBass leaning on a rear wall. Such a placement simulates its expected true operating position either on stands in a very small listening room or on a bookshelf next to sparsely placed books and other small objects. In this way our 'spliced' SPL curve (shown below) incorporated a small portion of Baffle Diffraction Step and produced some 85dB above 90Hz. 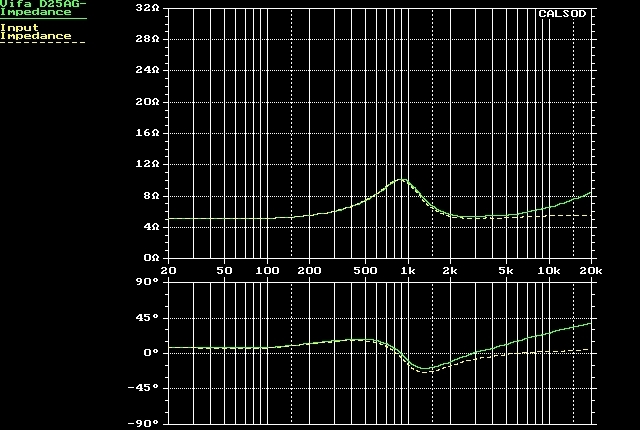 If we place BabyBass away from rear or side walls in a large listening room the very-low-frequency portion of this curve (below 300Hz) will be further suppressed : this SPL curve will not be correct. Observing the 40-60 Hz range of this curve yields a relatively low vent output. We must recal that in the previous design step we estimated the optimum box volume at 7.8lt and finally chose a value of 9.8 lt approx. Larger volumes decrease vent resonance frequency extending bass response towards lower frequencies. However vent's output pressure level decreases a bit. We could increase vent output level by selecting a shorter (than 16cm) vent length. This however would again shift vent resonance to higher frequencies. -What then? Which are our major design targets for the crossover filters? We want to straighten out the 100-1000Hz range of the Peerless woofer's SPL measured curve keeping in mind that the latter corresponds to an 'against-the-rear-wall' situation which will also hold in a very small listening room. Most of the times, in real-life crossover design, a third (electrical) order for the HP filter is needed to provide adequately steep roll-off and match a second-order LPF. In this case we started our design procedure with a second-order HPF topology ready to reconsider if necessary. Our next step was to optimize the rest of the second (electrical) order low-pass filter. We started with a 1.50mH/10uF set of values for the inductor/capacitor pair and changed these values in a way that would furnish a flat pass-band up to 1000-1200 Hz and a -6dBpoint somewhere around 2200Hz approximately. We stopped at a set of values quite close: 1.80mH/8.20uF for which the SPL response of the LF branch becomes as shown in the next picture. 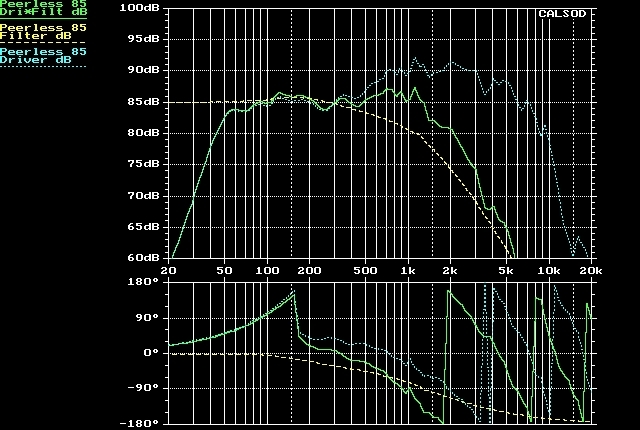 Blue dotted line stands for the driver response, the yellow dashed line is the gain response of the low-pass filter and the green one gives the overall SPL response of the acoustical LF branch. It is obvious that speaker sensitivity has been cut down to a 85-85.5 dB value in order to avoid the 'lack of bass' perception. 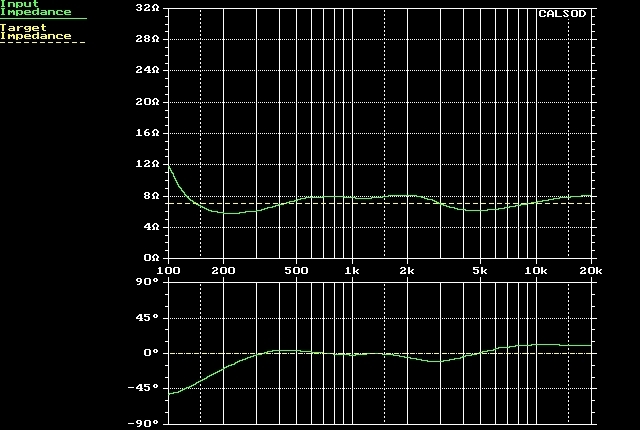 The -6dB point is only a bit higher than 2100Hz so that composite musical signals maintain their clarity: higher frequencies are not fed to the woofer. A multi-person choir singing is a typical example of such a musical signal. Of course these component values (and the associated SPL response) are not final unless a good match with the HF acoustic branch is ensured. Next step is about tweeter impedance compensation. In the following picture the RC zobel subcircuit attached to our tweeter was found to be optimum for a 8.2 Ohms/1.5uF set of values. Impedance resonance at 800-900Hz can hardly affect the response of the high-pass filter under design. That is why we rarely spend time, effort and cost for its compensation. If, however, our tweeter driver is not a chambered one this resonance will occur at much higher frequencies. In such a case it will affect seriously the HPF gain response. High cost crossovers usually contain additional compensating subcircuits. The design of the rest of the HPF was not an easy task. Tweeter SPL response is not smooth in the range 2000-4000 Hz so it is better to use as a target the -6dB point of the filter's electrical gain response. We tried to set the latter somewhere above 2500Hz just to make sure that electric power fed to our tweeter is not high enough to burn it. Generally speaking -6dB points below 2500Hz are rather risky and should be avoided. Blue curve stands for the tweeter SPL response, the yellow one for the filter's electrical gain response and the green one for the resulting HP acoustic branch SPL response. 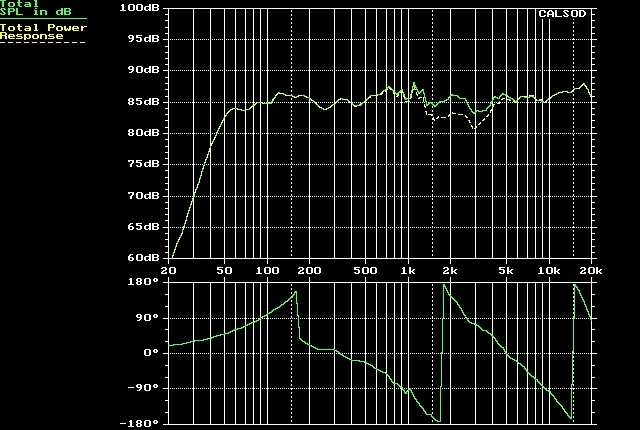 We have managed to lower HF sensitivity down to 85-86 dB. However we must test the degree at which the HF and LF branches match each other. We first tried a reverse (negative) tweeter polarity only to get a disaster in total SPL response. We then switched tweeter polarity to positive (woofer and tweeter in phase) and got the response illustrated above. Conventionally the crossover frequency seems to be at 2000Hz but if we smooth the peak of the HF response at 2500Hz we will easily end up with an approximate value of 2500Hz for the crossover frequency. 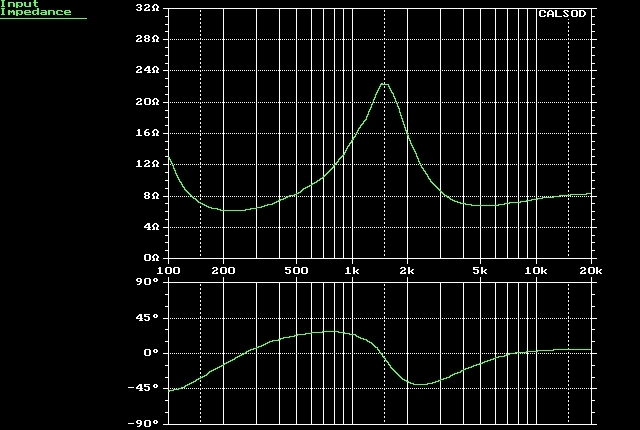 Power @ 1kHz is only due to woofer driver so power and SPL curves coincide. The same happens @ 4-5kHz where power is almost entirely produced by tweeter driver. 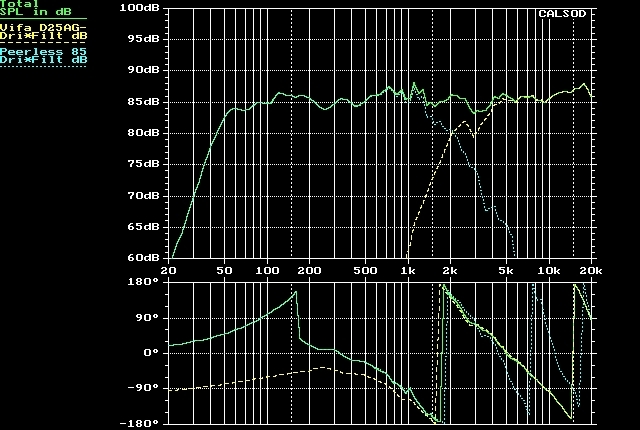 In the range 1kHz-4kHz power is distributed to both drivers (yellow curve) and their sound pressures add almost perfectly producing almost twice the respective pressure value. That is why pressure (SPL, green curve) response exceeds power response values by several dBs (3-4dB approx.) in the range 1.5-3kHz. We can recall that doubling a pressure value is equivalent to a +6dB boost in SPL response. The last part of our design protocol deals with impedance correction or compensation. It is not mandatory for such a 'low-power' speaker project. 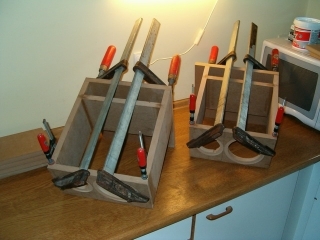 But as explained in the project's introduction many DIYers asked for it. The following picture gives us an impedance plot for the speaker as a whole when crossover filters are finished. Obviously we have a peak around 1500Hz. What actually happens in all crossover networks in terms of electric current flow is that as frequency rises the low-pass filter suppresses electric current and the high-pass filter starts conducting it. In the crossover frequency range these two effects work in a complementary way so that total current flow is generally preserved. However in most crossover circuits there are always narrow frequency regions where the filters fail to complement their current flow changes. In such frequencies overall current flow decreases (total impedance rise) or increases (total impedance fall). That is why peaks or dips are formed in the speaker's total impedance response curve. An 'Impedance Correction Scheme' (TM) is a simple idea where another subcircuit is placed in parallel to our finished crossover filter circuits. This circuit presents its own impedance and draws its own current. What we usually do is to make this circuit draw current in the narrow frequency region where our crossover network exhibits an impedance peak. Outside this region we make this circuit draw very little or no current at all. In this way the 'combined' impedance decreases in the frequency range where the peak was originally present. The 'combined' impedance curve becomes as flat as possible (compensated). A circuit suitable for compensating a relatively symmetrical impedance peak is a series RLC circuit. Obviously such a 'resonance' circuit should present a Q factor similar to the Q factor of the impedance peak to be compensated. In other words our RLC circuit must produce an impedance dip which is wide enough to complement the the resonance peak of the initial impedance curve. A designer is supposed to be able to estimate the Q factor of such a resonance peak and use the corresponding Q formula of a series RLC circuit to get values for the L and C components. In the case of BabyBass we had a peak of 22 Ohms at 1500Hz approx. We wished to drop it to a rough 7-8 Ohms value level. The only way to place a resistance in parallel to a 22 Ohms resistor and get a combined resistance value of 7-8 Ohms, is to use a 12 Ohm resistor. Therefore we need an RLC circuit having an R=12 Ohms approx. We also need a pair of inductance (L) and capacitance (C) that establish a resonance frequency at 1500Hz and a Q factor similar to that of the crossover filters' impedance resonance peak. The following diagram describes all the parts of the final crossover network assembly. The red part depicts the impedance correction subcircuit which is connected in parallel to the rest of the crossover network. 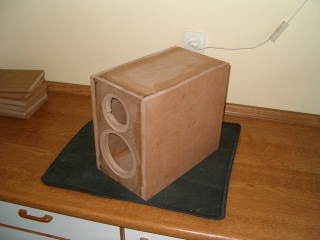 As expected a 'fresh' pair of BabyBass speakers were subjected to many hours of music reproduction and listening tests at various power levels and musical signal contents. A very small listening room was used with the speakers almost touching the rear wall. A moderate power amplifier was used as originally planned. The general picture was excellent with sound clarity and spectral balance outperforming most of the speakers we find in the very small volume category. What was most rewarding was that these results were achieved at a very small cost. Soundstage was excellent in absolute terms allowing for a direct comparison to very high cost speaker products (but at relatively low power levels of course). Many of us asserted that BabyBass could easily outperform even larger speaker products. In fact in 'blind' listening sessions most of the listeners could not even imagine they were listening to such a small speaker system. On the other hand BabyBass low sensitivity level (around 85 dB SPL/2.83Vrms) urged for higher electric power input. Just to make sure that such power levels would not easily trouble the low frequency operation of our woofer and cabinet, we placed inside the latter dense sound absorbing material. We used one layer two inches (50mm) thick, against all five enclosure walls. This improved high-power reproduction but lowered the vent's SPL output and up to a point exposed the speaker's inability to reproduce very low frequencies. After all design is the art of compromise. Placing BabyBass in larger rooms did not disapoint us. Spectral balance was very very good in absolute terms although very deep bass reproduction was rather weak. Soundstage was further improved and became capable of 'describing' sound sources well off the left or the right speaker positions.